The one-way adult fare for the Oakland/Alameda ferry using Clipper will be $4.75. The one-way adult fare for the Harbor Bay ferry using Clipper will be $5.00. The board decided to give all Clipper card users the discount price that is afforded to those who buy the bulk 20 ride ticket books. Oakland/Alameda passengers save $1.50 per ride ($4.75 Clipper e-cash vs. $6.25 regular cash fare) and Harbor Bay passengers also save $1.50 ($5.00 Clipper e-cash vs. $6.50 regular cash fare). This is similar to Golden Gate Ferry’s policy for all Clipper card passengers to get the same discount as their former printed ticket books. Prior to Clipper, the TransLink card gave the same discounts, regardless if the passenger rides regularly or just a few times a year. The board also decided to change the transfer policy for Muni. Effective October 1st, a passenger who paid the full fare in cash or used the ticket books was given the privilege to ride Muni for free away and to the SF terminal. The policy is now changing to 50 cent discount per direction and passengers must use the same Clipper card they paid to use the ferry to utilize the discount. This is exactly similar to Golden Gate Ferry’s existing transfer agreement with Muni. Those with the ferry paper transfers will still be able to use them on Muni until November 1st, they have granted a 30 day grace period for people to use them up. I like that Oakland/Alameda and Harbor ferries will be giving all Clipper card passengers the discount price, no matter if they are a regular commuter or just someone going to the farmer’s market on Saturdays. The discount price makes it attractive to casual passengers because a round-trip ride can save an adult $3 for a round trip ride. I applaud SF Bay Ferry for not trying to do something stupid by making passengers by Clipper card e-ticket discount books (I’m talking to you Caltrain). Without the need to buy bulk ticket books, there’s no more worrying if a passenger is running short and needs to get more; this means passengers can simply just recharge their Clipper card at vendors like the Bay Crossings booth in the SF Ferry Building, the Clipper card machines at Golden Gate Ferry SF terminal, or any Walgreens in the Bay Area. If you were to compare the cost to get from SF Ferry Building to Jack London Square ferry terminal, the ferry is the better choice. Passengers could take BART at Embarcadero, but the passenger must also take AC Transit too, and the total cost would be $5 ($3.15 BART and $1.85 discounted AC Transit fare for transferring from BART to AC). A trip on the ferry is $4.75. I’m disappointed at the decision to cut the Muni transfers to just 50 cents per direction. Muni put the pressure on WETA to cut it down; while they say it’s in line with existing agreements with Golden Gate and BART, I think it indicates the SFMTA is trying to save money. For regular commuters who uses ticket books, they get screwed because the ticket books gives free round-trip rides on Muni ($4 value), starting October 1st, they will have to pay $3 round-trip to ride Muni. Casual passengers who switch from regular cash to Clipper won’t lose any money. The cash policy (pre October 1st) gives passengers a free Muni round-trip transfer at full value ($4). But when reduced to a 50 cent discount to and from the Ferry Terminal and compared to the $3 in round-trip savings for paying their ferry ride with Clipper, there’s no gain or loss for them. Not to mention the 40 ticket books currently sold on the ferry (that can only be used within a calendar month). Those equate to $4.25/ride. For me, this would increase my daily commuting cost by $4 if I didn't change anything. For the year - approximately $750 (50 commuting weeks * 5 days per week * $3). My commute is Alameda to Fisherman's Wharf (Ferry to the F line). The reason I say "would" is because I am lucky enough that the company I work operates a shuttle in the city that picks up near the Embarcadero BART station. But that only addresses the cost portion - The schedule does not work as well, I will have an approximate 20min wait for the shuttle. So if I want to save $3/day, it will cost me 20 minutes. Damned if I do, damned if I don't. This is now making me consider one of the trans-bay buses, or even driving. There's always positive and negative impacts whenever there's a change. Following the footsteps of Golden Gate Ferry is a really good start, like you said, Caltrain should learn from this. There's a free shuttle on Broadway (M-F, Sat evening only), connecting BART and Jack London Square. The distance is also walkable. Transit riders of Alameda (including Bay Farm Island) would be more benefit from this. Still, transbay bus is the cheapest ($4.2). Ferries run on a limited schedule throughout the day, while BART and local AC Transit provide all day and more frequent service. 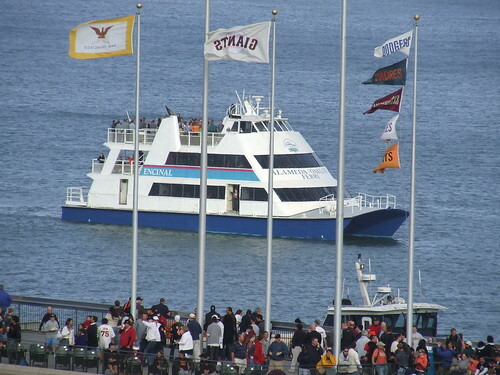 The target for ferry riders who live in Oakland or Alameda is "park and ride" or those being dropped off. For transbay service, OX runs during peak hours only, while O provides all day service in Alameda. OT: I've seen a public hearing notice at Balboa Park Station, SFMTA is planning to withdraw from the BART Plus Program.